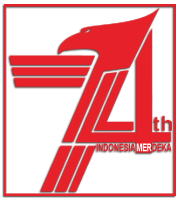 Some motorcycle manufacturers continue to innovate gave birth to the best products. Very intriguing, it turns out there are some that present roofed motorbikes that aims to protect the rider. In the two-wheeler automotive history has indeed sprung dozens of the roofed motorcycles that would protect the rider from weather conditions. If initially a prototype and concept vehicles, some of which have even been mass produced. 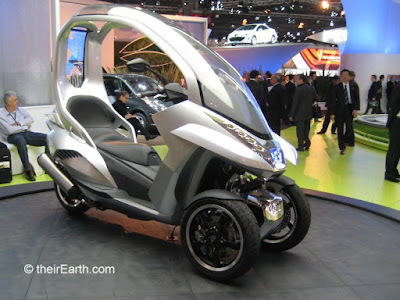 Actually there are several roofed motorcycles that we've discussed here, such as Paraves Ecomobile, Lit Motors C1, Toyota i-Road, etc. This motorcycle was produced short after it first appeared in 2008. Not only has three wheels, this bike also uses three-wheel-drive technology. In this motorcycle planted a twin electric motors on the two front wheels and a single supercharged 125 cc can burst the power up to 20 bhp for the rear wheels. The Peugeot HYmotion3 Compressor hybrid scooter has a top speed of 110 km/h (68.8 mph) and accelerates from zero to 100 km/h (62 mph) in 11.2 seconds. BMW made motorcycles had become the center of attention. How not driving these vehicles as combining a motorcycle with a car. 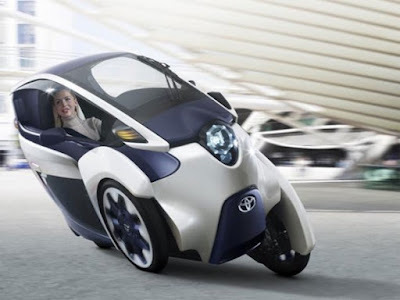 There are several the car's technologies embedded in the motorcycle. 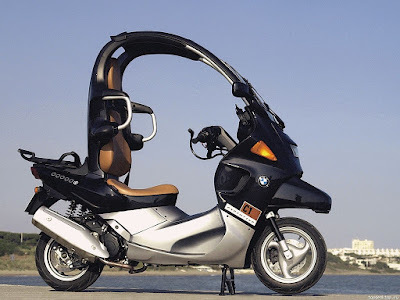 BMW even created two models with the engine capacity of 125 cc and 200 cc. 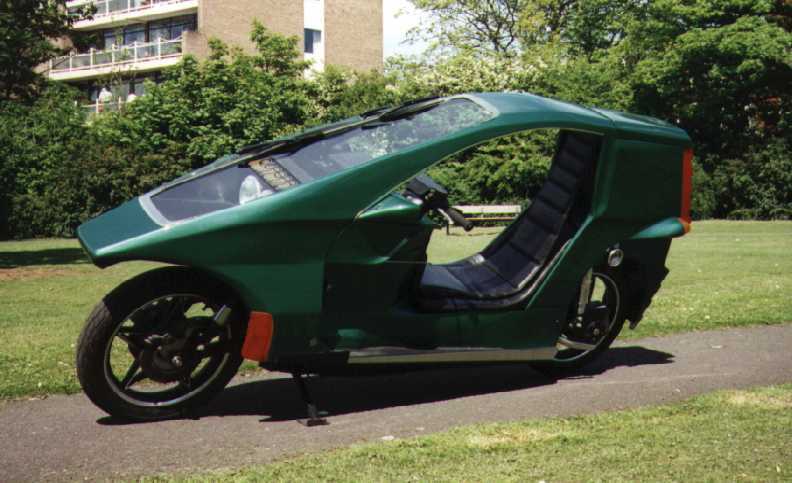 This was a concept bike that never actually got a proper unveiling. As with many of the car-bike hybrids with roofs, it’s actually got three wheels to lend a bit more stability but unlike the firm’s CLEVER concept, on which the rear wheels and engine remained upright while the front tilts, the Simple’s rear pair also lean. That gives it just enough of a bike-like feel to be included. The stealth fighter-esque styling is also a bonus. 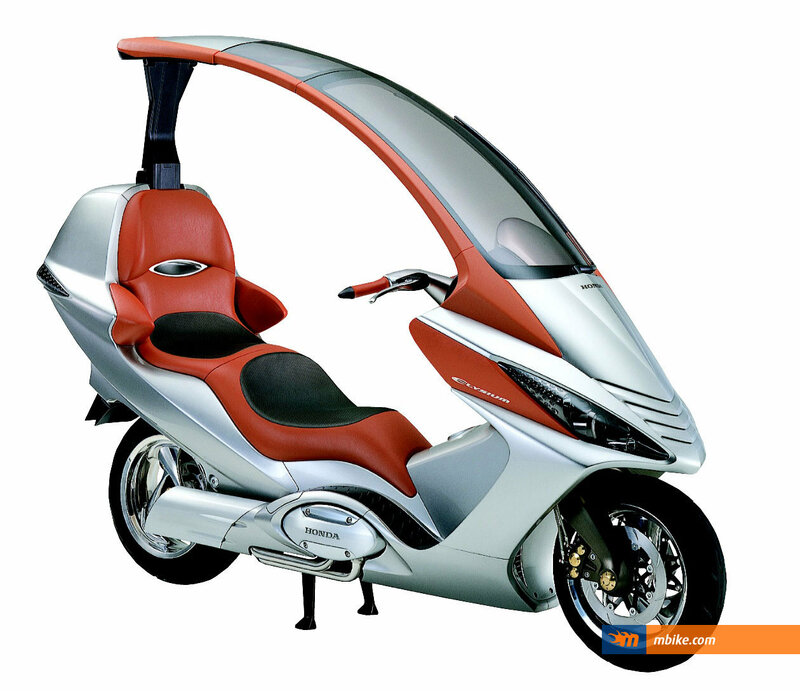 This motorcycle concept was first exhibited in 2001 is indeed very unique. On this motorcycle planted a liquid-cooled 4-stroke flat-4 engine with a capacity of 750 cc. But, unfortunately this bike was never be produced. 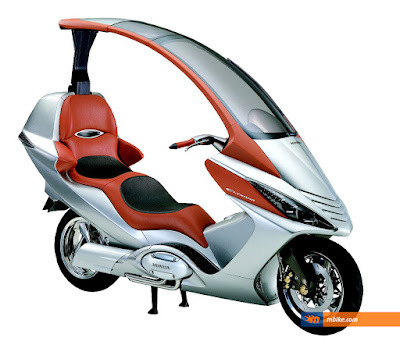 The Benelli unique motorcycle has the roof can be folded also and very thin. This motorcycle was produced from 2001 to 2006. The front screen has a built in wiper with screen wash. The rear luggage compartment has an 80ltr capacity with the roof folded out and is roughly halfed with the roof contained within. Benelli hopes this motorcycle will be able to become a serious challenger of the BMW C1. 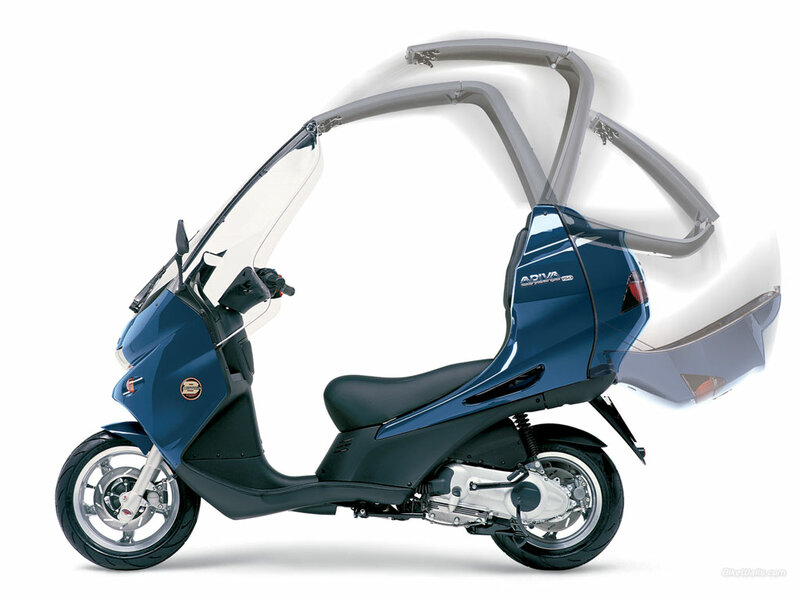 Again, the link between roofs and a third wheel rears its head, but the Honda Gyro Canopy very much reached production. In fact, tens of thousands have been sold during a production run that started way back in 1990. 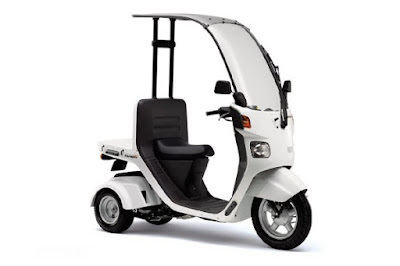 Like the rest of Honda’s oddball Gyro range, the rear wheels and engine are on a separate platform that’s attached to the main structure of the bike via a pivot, allowing them to remain upright. This bike is probably the oldest roofed motorcycles on the list. 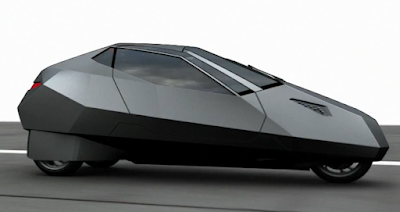 Quasar was built from 1975 to 1982 and produced only 21 units. 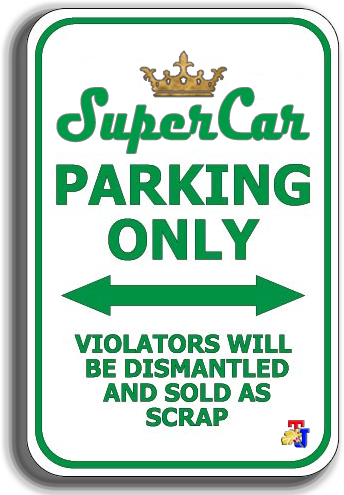 The entire power plant was taken from the Reliant Robin three-wheel car. The engine was used in absolutely standard form, giving a road-burning 41 bhp, which did not propel a 310 kg (680 lbs) motorcycle very fast.